As guest preacher Sunday, KRMCer Josh shared from his growing-up experience in the evangelical tradition, one of the six streams of faith Kern Roaders have learned about in our current worship series. Recognized by Streams of Living Water author Richard Foster as the Word-centered life, a life founded on the living Word of God, the written Word of God, and the proclaimed Word of God, “The evangelical tradition is comprised of three great themes: first, and foremost, the faithful proclamation of the gospel; second, the centrality of Scripture as a faithful repository of the gospel; and third, the confessional witness of the early Christian community as a faithful interpretation of the gospel,” Foster goes on to say at the Renovare website. Josh began his sermon by mentioning three things that the evangelical tradition is not…it is not limited to individual, personal salvation; it is not about just a literal reading of scripture, and it is not only about winning souls for Jesus, he said. The gospel has to do with the proclamation of good news, according to Josh, though somehow in some places, the evangelical tradition has become a message of individual salvation with an emphasis on getting into heaven…a narrow view, he said, adding that the good news is more about liberation from oppression or captivity or blindness, usually aimed at the poor, the marginalized, the downtrodden. The good news has many dimensions, he noted, including the individual dimension to be sure, but also political and economic dimensions by which a kingdom/community might be freed from systems of injustice and concerns in the here and now, as well as the future. Noting that Jesus responded to both physical and spiritual needs, Josh said that the evangelical tradition’s emphasis on missionary activity may sometimes leave physical needs unmet. Noting that Jesus’ healings sometimes led to relief from fever or to standing up and praising, Josh explained that conversion can come in a variety of ways, both physical and spiritual. The good news, he said, is about liberation, about a deep and rich exploration of Scripture, and about responding to the needs of others…the evangelical tradition is, indeed, an important stream in Christian history. 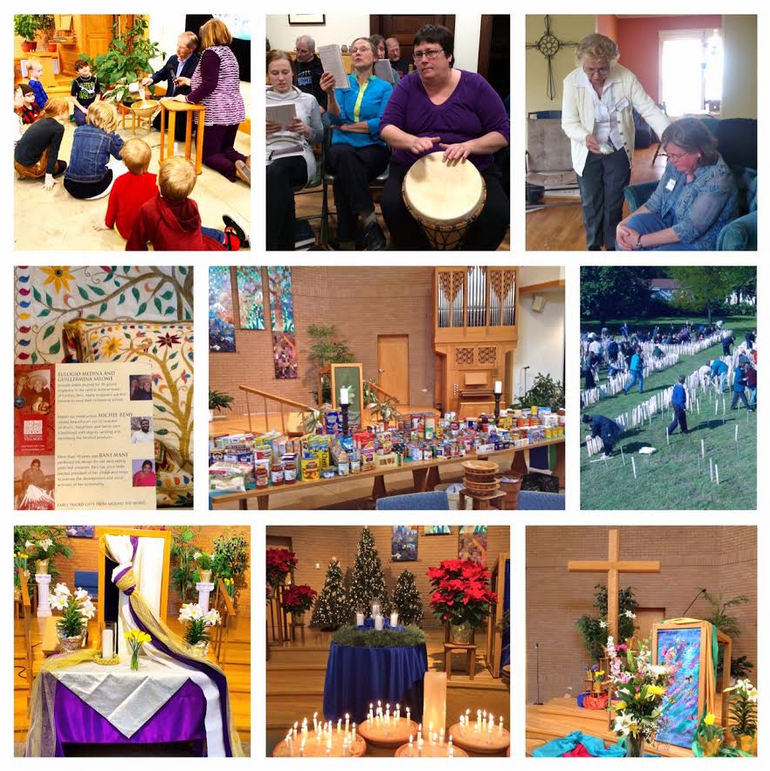 Some of the words and actions Kern has participated in include (top row of above photo collage) teaching our children, singing and praising, retreating and praying; (second row) outreach via our Ten Thousand Villages store, local food pantry collection, 2001 response to 9/11 (at a suburban Chicago church); and (third row) our worship visuals proclaiming Christmas and Easter good news. How have you been part of circulating the good news?